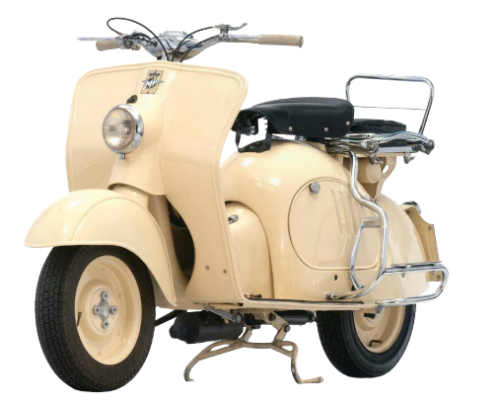 With the scarcity of rare materials in postwar Italy, scooter soonemerged as a popular, affordable, mod of transportation. MV entered the scooter market at the Milan Trade Fair in 1949, and in 1950, introduced the CSL model ( C Super Lusso). With its tubular and pressed steel step-trough frame and non-stressed body panels, it incorporated a forced air cooling duet that ran down the middle of the footrest platform to provide cooling air to the engine. For better cooling, the engine was equippede with a fan installed on to the magneto flywheeel. Its 2 stroke single-cilinder engine displaced 123CC, and its 6:1 compression ratio helped generate 5 HP to the rear wheel via a 4speed transmission. Production of this model was 2.500 units.